Just after WWII, the predominantly working class community of Texarkana have welcomed home their soldiers who are trying to find work and battle the post war blues. Just as they thought that things couldn’t get anymore downtrodden, a lunatic wearing a sack over his head begins to menace canoodling couples on Lover’s Lane, attacking several and leaving them traumatised. Later on, another unfortunate couple don’t get off so lightly and the maniac beats both of them to death. As events unravel the killer soon begins to target unfortunate victims in their own homes… Soon, the town is in the icy grip of panic and fear. The bulk of the film follows the woefully inept police as they try to track the brutish killer. It’s during these stretches that events become muddled and wildly uneven as Pierce seems to think it’s a good idea to mix elements of slapstick comedy with tense moments of genuinely grimy violence. This effectively kills the carefully constructed mood of the other scenes where the hooded psychotic wrecks bloody mayhem. As mentioned, the cops are usually involved in some sort of buffoonery that decimates the eerie atmosphere, notably the deputy nicknamed ‘Spark Plug’, because, you know, he isn’t very bright and stuff. He drives the Ranger around town and generally riles the viewer with his idiotic tomfoolery at every opportunity. There is even a scene where he has to dress as a woman in an attempt to foil the killer. Hilarious. Yes, this hair-brain scheme was concocted by Texarkana’s finest with their infinite wisdom. The cops decide to stake out a few places on Lover’s Lane and pretend to be young couples. However as there are no women on the force, what with this being the forties and all women were ‘in the kitchen’ making home, ole’ Spark Plug draws the short straw and dons a wig and a dress and warns his partner not to get too frisky. Like I said, hilarious. A terrific sequence occurs when a number of cops are sitting in a diner discussing the mysterious case. As they ramble on about the fact that they simply have no idea who the killer could be and the very real possibility that it could be anyone living in the town, the camera lowers and treks along the floor of the diner until it comes to a pair of familiar looking boots belonging to someone sitting in the very next booth. The killer himself! This deceptively simple and understated scene contains a hefty and unshakable impact. 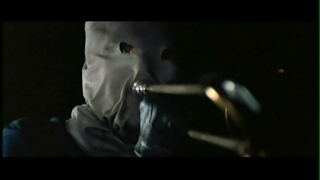 The films strengths lie in the several scenes featuring the hooded killer stalking and attacking his victims. 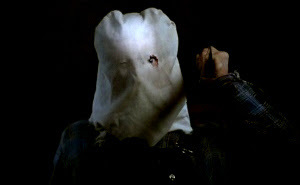 The sight of the hulking brute wearing a potato sack over his head is rather unnerving and its easy to see where Steve Miner got the inspiration for Jason’s look in Friday the 13th Part 2 (1981) - pictured above. The tension that stirs up whenever he moves into shot is at times unbearable, particularly in the scene where he bursts his way into a woman’s house after he has appeared at the window and shot dead her husband as he read the evening news. Said woman is unceremoniously shot in the face but manages to drag herself, painfully slowly, out of the house and into the corn field that surrounds her home. What follows is a continuation of the tension that was heaped up when the killer invades her home, as he stalks her through the field until she finally manages to get to her neighbours house and get help. While most of the night scenes are incredibly murky, it sort of adds to the gritty, ‘realist’ feel that Pierce uses to great effect. In an earlier scene this woman is shown smiling uneasily at someone we can’t see, sitting in a car outside the grocery store she has just left, again implying that it could be someone who lives in town who could easily assimilate themselves back into community life and remain undetected after their bloody conquests. Chilling stuff. An extremely odd and strangely disturbing moment takes place when the killer, having hauled a young couple from their moving car, beats the young man senseless and then shoots him before turning his attention to the young woman. Lashing her to a tree he proceeds to fix a knife to her trombone and then furiously blow the instrument so the knife repeatedly stabs the girl. Odd. And more than a little disturbing, particularly the close-up shots of his eyes as he blows furiously into the instrument. 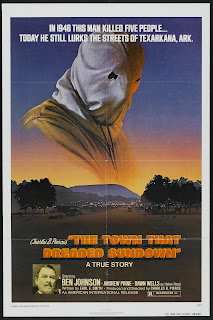 Despite the comedy killing moments, of which there are plenty, the film still manages to maintain an air of menace and dread, particularly when the police enforce a curfew on the townsfolk. The fact that this case was never solved also hangs heavy throughout the film, and although no one says it, the idea that ‘the killer is still out there’ lurks ominously in the background as the film draws to a close.